The German Gothic style Sts. Peter and Paul Church, consecrated in 1875, was the German Catholic Church for South St. Louis. 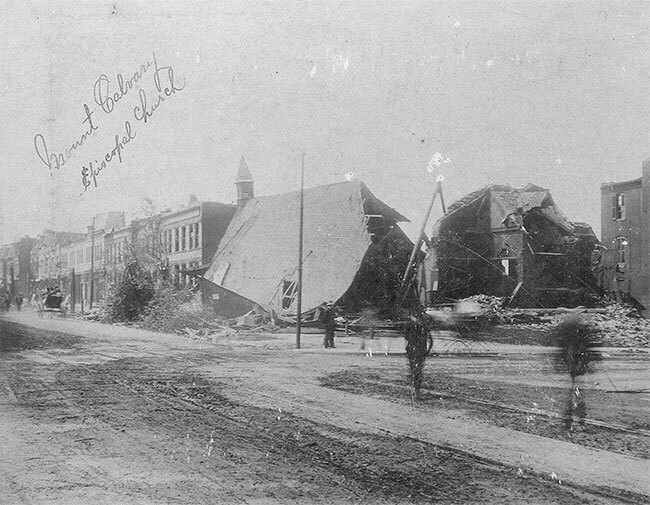 It was located on Allen Street between 7th and 8th streets in the Soulard neighborhood, one of the areas hardest hit by the tornado. It was rebuilt on the same site and still stands today. St. Paul's German Evangelical Church. Located at Ninth Street and Lafayette Avenue, this church had been built in 1874. Although almost destroyed, it was rebuilt on the same site. Ruins of Mt. Calvary Episcopal Church. This building was designed by Theodore C. Link, architect of Union Station, and completed in 1877. 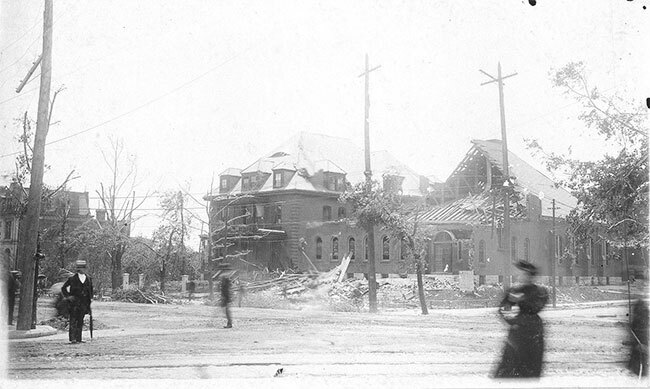 It stood on the southwest corner of Lafayette and Jefferson Avenues, and was damaged beyond repair by the tornado. The congregation could not pay its mortgage, so owner William Barr reclaimed the land. In 1905, he donated this lot to the St. Louis Public Library, and it became the site of the library's oldest branch, Barr Branch. 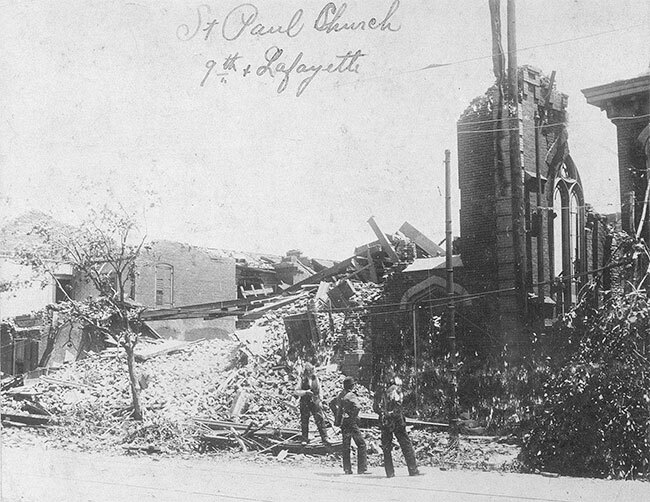 The Lafayette Park Methodist Episcopal Church was on the corner of Lafayette and Missouri Avenues, across the street from Lafayette Park. The congregation had built and occupied this stone Romanesque Revival building in 1888. 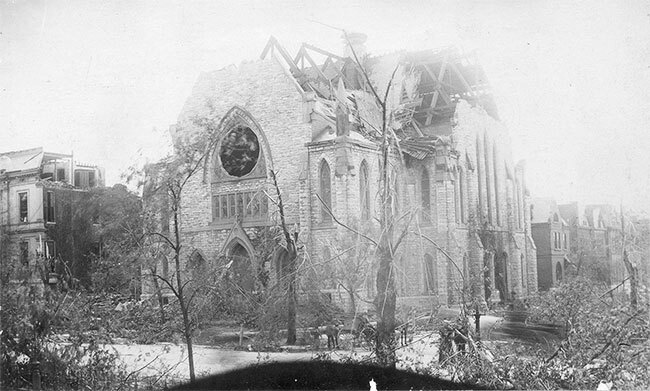 The church's sanctuary sustained heavy damage and was rebuilt and enlarged to designs by Theodore Link. St. Paul's German Evangelical Church. This church, located at Ninth Street and Lafayette Avenue, had been built in 1874. Although the tornado nearly destroyed it, it was rebuilt on the same site. Lafayette Park Baptist Church. 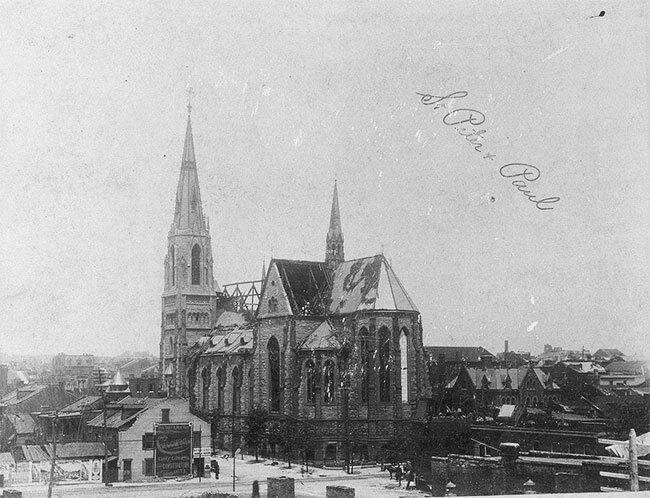 Located at Lafayette and Mississippi Avenues across the street from Lafayette Park, this church had been built in 1888. Although badly damaged by the tornado, it was rebuilt on the same site. Church of the Unity. 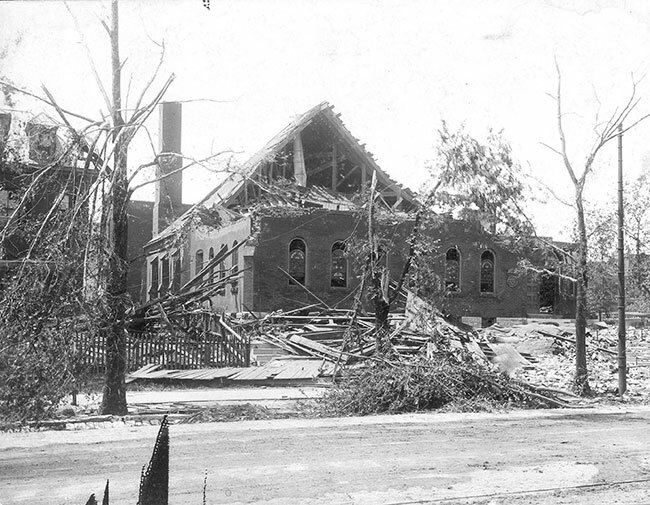 This Unitarian church, at the corner of Park and Armstrong Avenues across from Lafayette Park, had just hosted a wedding an hour before the tornado struck. 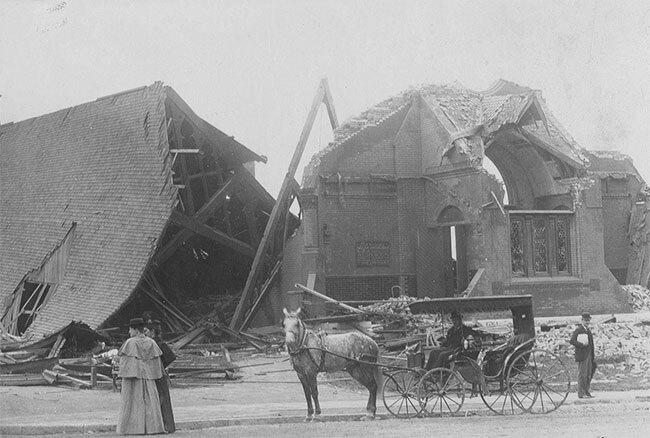 A newspaper reported that a woman who tarried there after the others had left thought it would provide shelter during the approaching storm, but was forced to flee outside when the roof caved in. Although it lost its entire roof, this church was rebuilt on the same site. Note the dozen or so mattresses draped on a tree. Armstrong Avenue is now named MacKay Place. Mt. Calvary Episcopal Church. 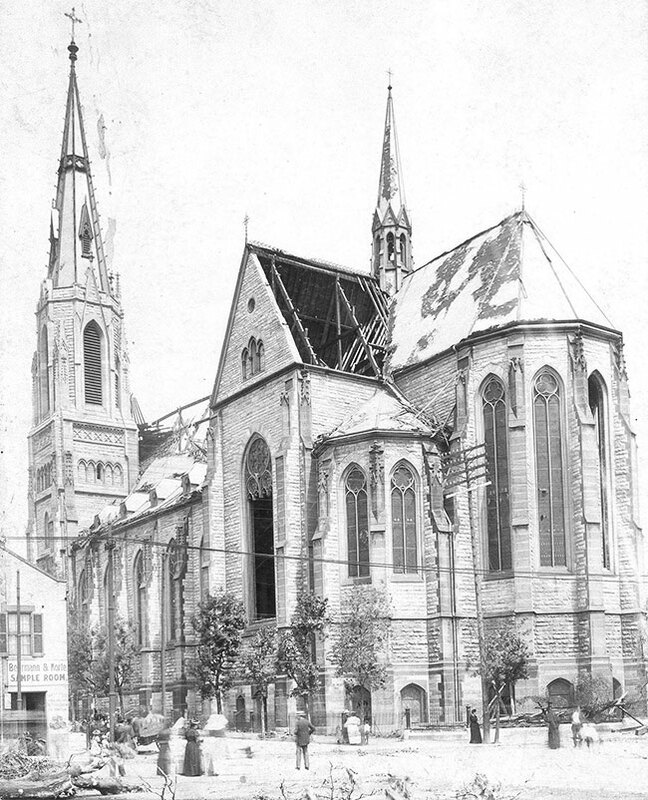 This church had stood at Jefferson and Lafayette Avenues since 1877. It had been designed by architect Theodore Link , whose most famous building is St. Louis Union Station. 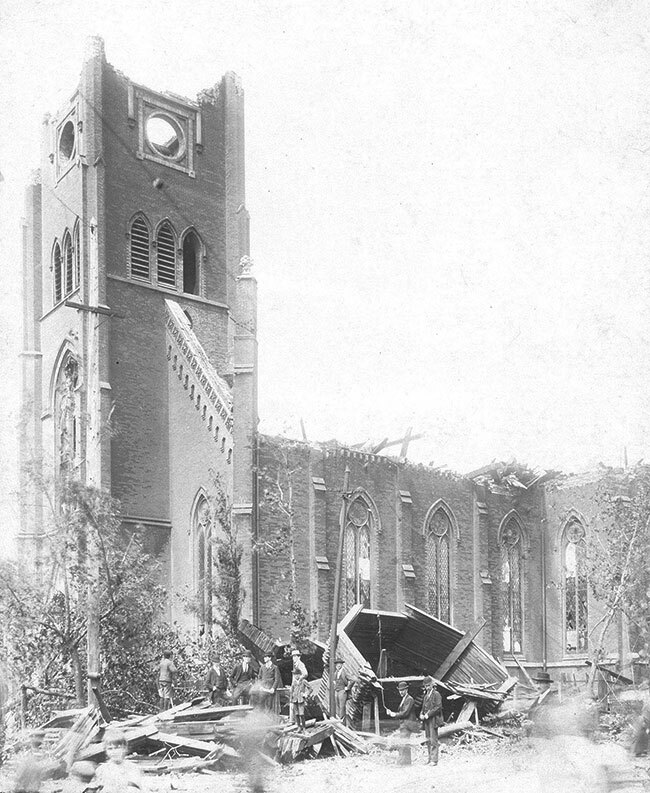 The building was damaged beyond repair by the tornado. After the congregation found it could not continue to pay its mortgage, landowner William Barr reclaimed the property. In 1905, he donated this lot to the St. Louis Public Library, and it became the site of the library's oldest branch, Barr Branch. Lafayette Park Presbyterian Church. This Gothic Revival style church, located at Missouri Avenue and Albion Place across the street from Lafayette Park, was built in 1878. 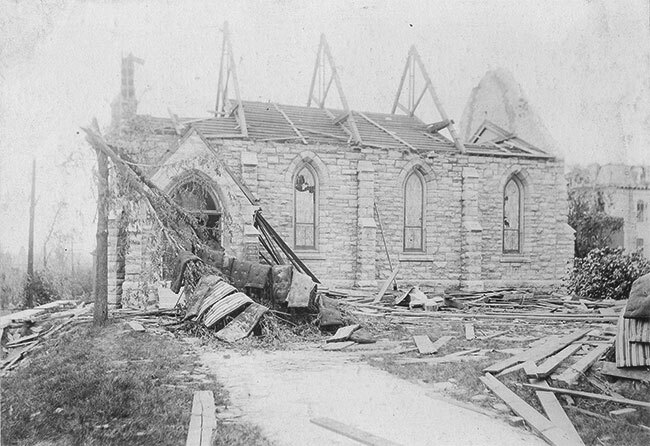 Although devastated by the tornado, its Sunday School room was used to gather and dispense donated clothing after the storm. Services were held in its basement until the building was sufficiently rebuilt to hold a Homecoming Service in the sanctuary in November, 1896. Lafayette Park Baptist Church. This church, on the southeast corner of Lafayette and Mississippi Avenues across the street from Lafayette Park, had been built in 1888. 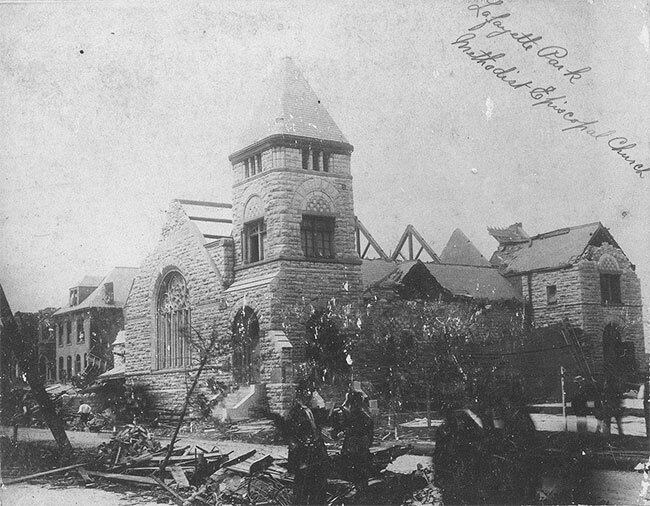 Although badly damaged by the tornado, it was rebuilt on the same site..
Trinity German Evangelical Lutheran Church. This church, at 8th and Soulard Streets, was presided over by Lutheran theologian Dr. Carl F. W. Walther, founder of the Missouri Synod and President of Concordia Seminary. This Gothic Revival building had stood since 1865 as the mother church of the synod. It was reconstructed on this same site. View of the damaged apse of Sts. Peter and Paul Church. This German Gothic style church, consecrated in 1875, was the German Catholic Church for South St. Louis. 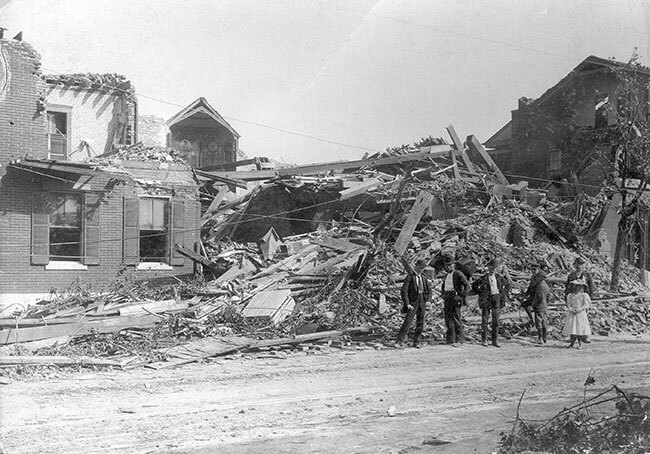 It is located on Allen Street between 7th and 8th streets in the Soulard neighborhood, one of the areas hardest hit by the tornado. It was rebuilt on the same site and still stands today.